Brewers and distillers alike are keen to cash in on coffee's profitability, coming out with a variety of coffee-centric products. With the ready-to-drink coffee industry pulling in $2.6 billion, big name beverage alcohol players and hyper local producers alike are eager to capitalize on the drink’s skyrocketing popularity. As such, a slew of coffee-flavored alcohol beverages—ranging from beers made with coffee beans to whiskies cold brewed in barrels—have hit the market in recent months. Agave Loco has extended its RumChata brand with an ice coffee alternative. 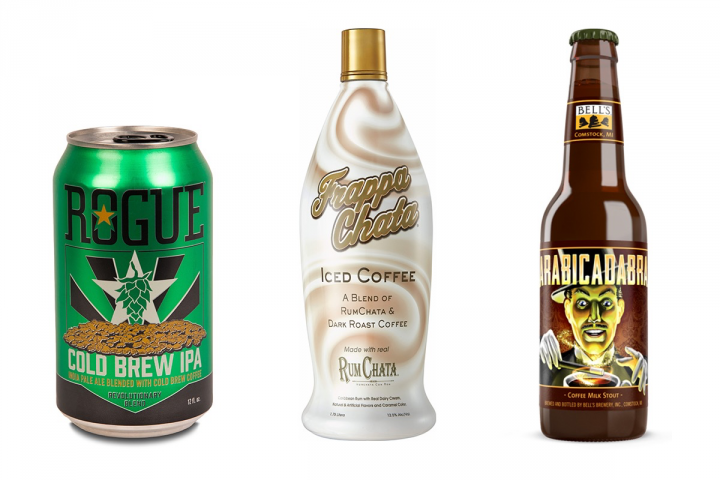 FrappaChata ($19.99 a 1.75-liter bottle) is a ready-to-drink alcoholic iced coffee that blends RumChata cream liqueur with Arabica and Robusta dark roast coffees. The 12.5-percent abv offering is available in Illinois, Wisconsin and Minnesota, with a national launch to follow. Visit Rumchata.com for more. Bristow, Virginia-based MurLarkey Distilled Spirits has introduced coffee-infused whiskey to its range. The new flavor is a blend of the distillery’s Justice white whiskey and gourmet coffee beans sourced from Virginia’s Vint Hill Coffee, cold-brewed in batches for one week in white American oak barrels. Murlarkey’s Coffee whiskey is available at Virginia ABC stores, retailing at $30 a 750-ml., and throughout Washington, D.C., where the brand is distributed by Breakthru Beverage Group. For more information, visit Murlarkey.com. Medfield, Massachusetts–based AstraLuna Brands has debuted Cape Cod Coffee Flavored Vodka in a collaboration with Cape Cod Coffee. The 64-proof vodka—the first extension of the company’s Cape Cod Vodka line—is made from potatoes and blended with cold brew coffee extract prior to bottling. The new coffee-flavored addition is available with limited distribution across Massachusetts for $24.99 a 750-ml. Additional information can be found at Astraluna.com. Michigan-based Bell’s Brewery has launched its newest fall seasonal. Arabicadabra coffee milk stout (pricing varies by market) is brewed with coffee beans roasted by Grand Rapids, Michigan–based Ferris Coffee. The 5.5-percent abv brew is available in six-packs of 12-ounce bottles in select states. Visit Bellsbeer.com for more information. Newport, Oregon–based Rogue Ales & Spirits has introduced a new beer. Cold Brew IPA ($10.99 a six-pack of 12-ounce cans) is made with Stumptown Coffee Roasters’ cold brew coffee, which is brewed for over 12 hours, double-filtered and then blended with an IPA. The 7.5-percent abv offering is available nationwide. To learn more, visit Rogue.com. Alaskan Brewing Co. has released two fall seasonals: Heritage Coffee Brown Ale and Mocha Milk Stout, both made in collaboration with Heritage Coffee Roasting Company. The 7-percent abv Heritage brown ale incorporates coffee throughout the brewing process—malts are roasted in a coffee roaster, and cold-brewed Brazilian coffee is infused during the kettle boil and at the end of fermentation. Meanwhile, Mocha Milk Stout (also 7-percent abv) is a coffee- and chocolate-forward beer made with cocoa nibs and Guatemalan coffee, with added lactose to enhance the beer’s creaminess. Both Heritage Coffee Brown Ale and Mocha Milk Stout are available now through October across Alaskan’s distribution footprint, in six-packs of 12-ounce and 22-ounce bottles, respectively. For additional information, visit Alaskanbeer.com.